The Dahle 40214 Small Office Level P-4 shredder offers a 9 1/2" feed opening that empties into an 11 gal. waste compartment, and can shred up to 11 sheets at once into 1/8" x 1 9/16" cross cut pieces. This elegantly designed machine features a cutting mechanism that rests on vibration absorbing rubber shock mounts. When in operation, the entire head "floats" in the wooden cabinet and produces minimal noise. Additional features include auto on/off, reverse, and continuous run operation. The Dahle 40214 is equipped with SmartPower to reduce power consumption and conserve energy. Small offices or teams of employees will benefit from the ease of use and quiet operation of this convenient shredder. Designed to shred between 100 and 400 sheets per day. The 40214 offers quick and easy destruction of confidential materials. Transcript: This is the Dahle Small Office Level P-4 40214 Shredder! Turning it on puts it in standby mode to automatically start and stop shredding up to 9 pages. 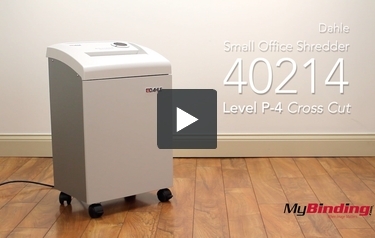 This is the Dahle Small Office Level P-4 40214 Shredder! The 40214 is a cross-cut machine that offers level 3 security. The shreds this device produces measure 1/8" x 1-9/16" so you will be able to keep Social Security numbers, banking information, and other private data under wraps. The feed opening is 9.5" wide so you will be able to shred both letter- and legal-sized documents. This shredder has a thermally protected motor so you don't need to worry about it overheating. There is also a SmartPower energy management system that helps you reduce your power consumption. This feature causes the shredder to use less power when it's idle. The 40214 is extremely durable since it features a cutting head that's made out of solid German steel. There is a wooden cabinet that houses the waste bin as well as rubber shock mounts to absorb vibrations. The shock mounts really help reduce noise so your work area won't get too noisy when you're shredding. This machine has an 11-gallon waste bin so it's definitely suitable for small offices. You will be able to share this device with a few co-workers without any trouble. If you want to slightly increase the waste bin's capacity, just line it with a gusseted shred bag. The 40214's cutting cylinders are backed by a lifetime warranty. Parts and labor are covered for 2 years for your peace of mind. The 40214's main weakness is its shredding capacity. The machine can only shred 9 to 11 sheets at a time, so it will take you a while to get rid of large amounts of paper. At most, this device can shred 400 sheets per day. You won't be able to shred DVD's, CD's, or floppy disks with this device. However, there are multimedia shredders out there that can do the job. This machine is fairly big and its dimensions are 28" x 17" x 13.75". You might not be able to fit it under a desk. Luckily, this device is easy to move around since there are casters on the bottom of it. Overall, the Dahle 40214 is a cross-cut shredder well worth checking out, especially if you need a machine that can give you level 3 security. Although this device has a fairly low shredding capacity, it is far from unexpected since cross-cut machines typically shred less per pass than strip-cut devices. Thus, if you need a machine with a high shredding capacity, a strip-cut shredder is your best bet. Also, don't forget that the 40214 has some terrific special features such as a thermally protected motor and the SmartPower energy-saving system. This is a good cross-cut shredder for small offices, so be sure to take a look at it if it sounds like the right shredder for you. Size 1/8" x 1 9/16" 1/8" 1/8" x 1 9/16" 1/4" 1/4" 1/8" x 1 9/16"